Two (2) vintage lady's diamond dress watches. 1st item: Lady's .900 platinum Movado diamond dress watch attached to a black cord bracelet with 14k white gold clasp with safety chain. 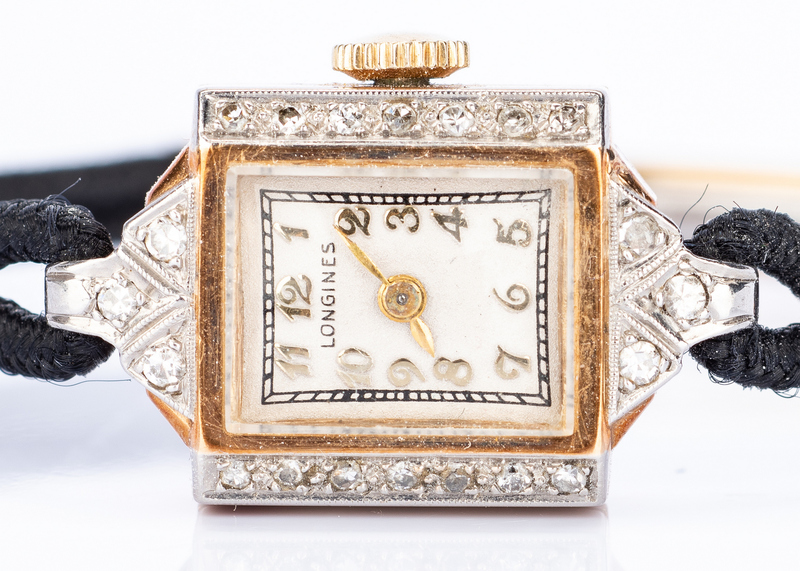 The watch case and lugs hold a total of 36 round brilliant cut and baguette cut diamonds with an estimated total weight of approximately 2 1/3 carats (VS1-SI1 clarity, G-H color). 15.8 grams total. 2nd item: Lady's 14k yellow gold Longines dress watch attached to a black cord bracelet with gold-filled clasp. The watch case holds 20 round single cut diamonds with a total weight of approx. .20 ct. 10.2 grams total weight. Provenance: Private Nashville, TN estate. CONDITION: 1st item: Watch appears to be in working condition at time of inspection. Overall very good condition. 2nd item: Watch in working condition at time of inspection.